Minefield is a simple game where you have to get as many men as you can across the minefield to safety (marked by a blue flag). You start at the bottom right square of a grid of up to 20 x 15 squares. Use the arrow keys on the keyboard to move the man to the flag. The grid is filled with mines. You die if he steps on a mine (duh!). The minefield is randomly generated when you start a game, but the mines stay where they are throughout the game so try to remember where they are when after stepping on them. In addition to the mines, you also have to avoid up to 2 snakes and 2 ghosts. 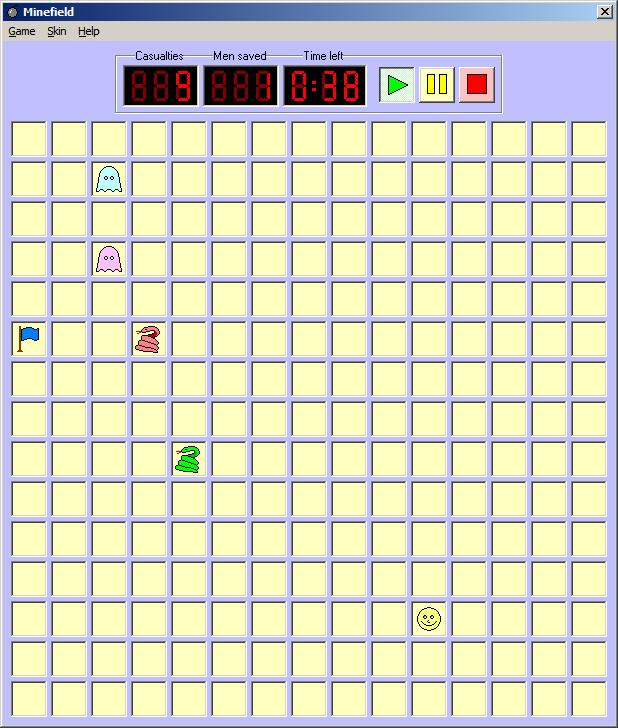 Snakes can only move on squares which do not contain mines, whereas ghosts can move anywhere in the grid. You die if you touch them (duh! again). You may, on occasion, pick up a map or invincibility potion. The map shows you the location of every mine in the grid, whereas the potion makes you invincible (ie. cannot be killed by mine, snake nor ghost), for a period of time. You may sometimes also be blown to another square by a strong gust of wind (this can only happen if you step on a square that does not contain a mine). Minefield is skinable! You can replace all Minefield graphics with your own.